This is a cleanser and shaving cream, it is designed to leave your skin feeling soft, smooth and supple after shaving. The herbs and plant based soaps in this product are gentle enough to leave the skins natural defenses in place but tuff enough to remove dirt, cleanse pores and a treat for your skin. It has 10% Vitamin C and Bergamot, Sweet Orange, Nerolina and Lemon Essential Oils to give you a refreshing citrus cleanse. 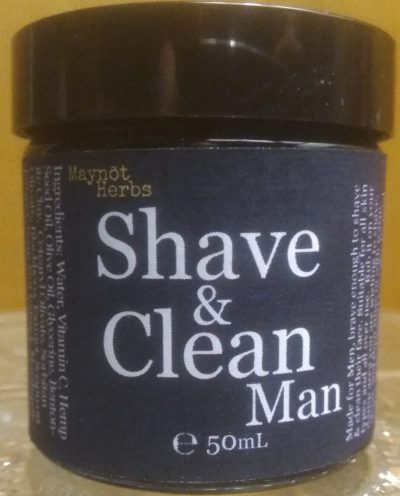 Made for Men, brave enough to shave & clean their face. Suitable for all skin types and all over use. Rub it on your damp area you are wishing to shave, shave and then rinse in with warm water or in shower! Can also be used to wash dirt off ya face or leave it on as a Vitamin C treatment (for 20 Mins) the girls do!